The following diagram shows the exterior angle theorem formula. 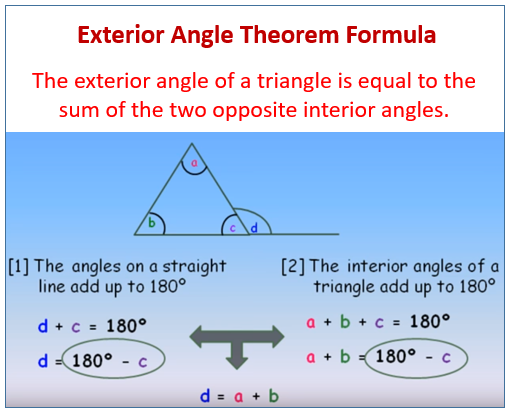 Scroll down the page for more examples and solutions using the exterior angle theorem formula to solve problems. This video discusses the exterior angle theorem. It also define what exterior and remote interior angles are. Two example problems are solved in detail. The first example problem is pretty basic. The second example problem is much harder. This video explains the exterior angle theorem of geometry. The theorem is used to work out some applications in finding angles of a triangle. Students learn the exterior angle theorem, which states that the exterior angle of a triangle is equal to the sum of the measures of the remote interior angles.